In 1921, heavy rains caused the San Antonio River to flood downtown San Antonio. It wasn't the first time, but this flood was especially tragic. More than 50 people were killed, and nine feet of water inundated businesses. The city had to act. A plan to divert and pave over the river was being considered. But 27-year-old architect Robert Hugman, a San Antonio native, had a different idea. Taking a cue from the French Quarter in New Orleans, where he had practiced architecture after studying at Massachusetts Institute of Technology, Hugman wanted his hometown to embrace its Spanish heritage and create a completely new kind of waterfront park that would both address the engineering challenge at hand and attract people to the city's downtown. Hugman's plan called for a winding, landscaped canal that combined the best of Venice with a Spanish Revival aesthetic. His proposal, romantically named "The Shops of Aragon and Romula," described a below-grade promenade onto which pedestrians would descend from street level, entering "a quaint old cobblestone street rambling lazily along the river." They would encounter gondoliers poling along, cafes and shops, and park-like settings, including "a sunken garden comparable in beauty to the famous gardens of the Alcazar, or the Alhambra." An important part of his plan called for businesses to open onto the river, rather than turning their backs on it. It took years of lobbying, but Hugman, joined by hotelier and future mayor Jack White, finally convinced local officials to endorse his plan. Robert Hugman was a man ahead of his time. Due to a variety of economic and other factors, it was years before the River Walk opened, and decades more before it reached its full potential. 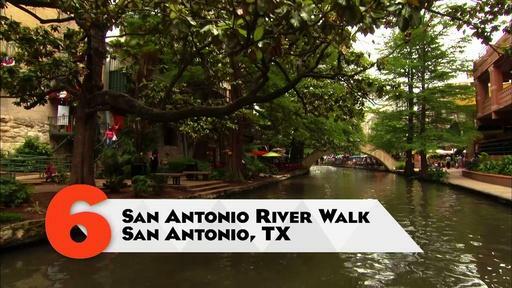 But today, the San Antonio River Walk is one of the most popular tourist attractions in Texas, and the concept has been emulated by other cities hoping to appeal to convention goers and visitors of all sorts. Hugman showed that a park could take a completely different form than anything imagined before - and that a romantic vision might sometimes also be the most successful one. Read a timeline of events related to the creation of the San Antonio River Walk. Read a biography of Robert Hugman. Learn about the San Antonio River and its history. Plan a visit to the San Antonio River Walk. Plan a visit to the Alamo. Robert Hugman’s design for a winding, landscaped canal solved an engineering problem for San Antonio–and created a tourist magnet.